Most people know the island of Bali as a tourism mecca of Asia Pacific. But 20 years after the first courses were opened there, not so many are as familiar with Bali’s golf credentials. Recognised and revered for its sumptuous resorts, spas, food, culture, ambience and happy, welcoming people, Bali is raising its golf profile through a new co-operative marketing group, Bali Golf Paradise, which aims to turn the Island of the Gods into the Island of Golf as well. 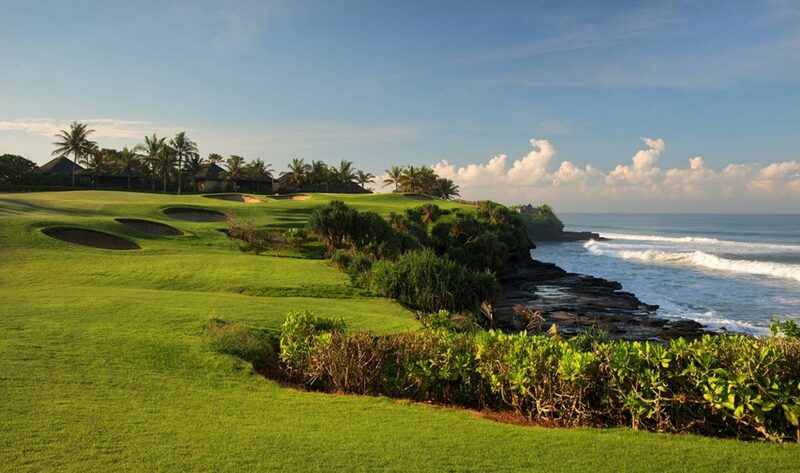 The imminent re-opening of Bali National Golf and Country Club, formerly known as Bali Golf and Country Club, at Nusa Dua, after a 19-months makeover is a catalyst for Bali’s new golf tourism push. By far the best known of Bali’s courses is Nirwana Bali Golf Club at Tanah Lot, about 45 minutes drive west of the island’s Kuta-Seminyak- Legian tourism hub. This Greg Norman design opened 20 years ago and has long been regarded as one of the best courses in Asia. Indeed, just a few months ago US Golf Digest includes it among its best 100 courses outside the United States, while Forbes Travel Guide has named Nirwana among Asia’s 10 most elite golf courses. The on-site 278-room Pan Pacific Nirwana Bali Resort includes 12 one and two-bedroom villas as well as hotel rooms. It offers golf stay-and-play packages, which provide a welcome opportunity to escape Bali’s notorious traffic on the island’s narrow roads. Re-opening in April after a complete makeover of the course, Bali National Golf and Country Club, formerly known as Bali Golf and Country Club, is considerably raising the Bali’s golf stature. Also with a 20-year history, the course is located at Nusa Dua, a popular high-end tourism destination. The original Nelson Wright Howarth design has been kept largely in place by the same design firm, now called Nelson Howarth, with new fairways and greens and considerable extra bunkering, some running the entire length of holes. A Shangri-la hotel is to be built on site within the next two or three years, complementing an already-large selection of five-star properties next to and close by the course. Under its original guise, Bali Golf and Country Club hosted the 1994 Asian Dunhill Masters and was named by Fortune magazine as one of Asia’s five best golf courses. Now, following the remake and renaming, the course has stepped up another couple of notches, with revamped finishing holes bringing players to a sumptuous new clubhouse overlooking the 18th green. New Kuta Golf Club at Pecatu on the Bukit Peninsula is Bali’s newest course. Like Nirwana, the Ronald Fream-designed links-style par-72 layout features scenic oceanfront and challenging inland holes. It is set within the rapidly developing Pecatu Indah Resort area above a soaring limestone cliff overlooking stunning Dreamland and Balangan beaches and is less than 30 minutes drive from Ngurah Rai Airport. New Kuta hosted the 2009 Indonesian open, was recently voted in the top three of the best maintained courses in Asia Pacific and was named leading golf resort in Indonesia for 2013-14. The Golf Academy Bali has an on-site teaching facility at which British PGA pro, Rory Young, provides tuition to visitors. The facility includes a 42-bay floodlit driving range, large putting and chipping green and practice bunker. Stay-and-play packages are available with the New Kuta Condotel, located just five minutes from the course. Bookings for a memorable golf holiday to Bali can be booked through Golfasian.